Sarah Vaughan was one of the illustrious coterie of female vocalists who spanned the genres of jazz, big band music and sophisticated pop during the post-war era to provide some of the finest music of their times, not only interpreting the Great American Songbook and putting their own individual stamp on it, but continuing to perform top class new material through the musical upheavals of subsequent decades. Described by renowned music critic Scott Yanow as the “possessor of one of the most wondrous voices of the 20th century” she performed and recorded consistently through to her demise in 1990. This great-value 49-track collection focuses on her early years as she established her reputation performing with various orchestras and bandleaders, as well as making her first solo recordings and having her first chart successes, before she joined Columbia Records in early 1949. It features performances with some of the greats of the era, including Billy Eckstine, Dizzy Gillespie, Teddy Wilson, Dickie Wells Tadd Dameron, Lester Young and others, as she recorded for several different labels – Continental, Guild, Musicraft, Crown, Gotham and Hot Record Society – plus ‘live’ recordings. It includes her first Billboard chart entries in 1948 with “It’s Magic” and “Nature Boy”. It’s an entertaining scene-setter for what was a glittering career to come, and underlines that even in these early years she had a highly developed and distinctive talent, for which this anthology is a fine showcase. 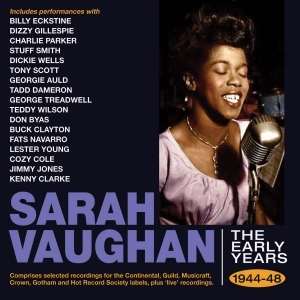 17 The Man I Love Sarah Vaughan with Lester Young Orch.